Cia Devan recently combined a seasoned eye for photographic abstraction with a persistent pictorial sense to systematically explore a number of familiar landscape themes. The result was the discovery of certain remarkable images, on exhibit through the end of February at the Riverview Cafe in Brattleboro. This is Cia's second exhibit of photographs at the Riverview. Previously, she showed a group of abstract compositions entitled "Hull Portfolio." These pictures captured the varying textures of aging metal and deteriorating paintcombined with the sharp and often warm light of the boatyard. They demonstrated a love for abstract arrangement in composition. Cia's eye for abstraction is brought to a more familiar arena in her various landscape series in this second exhibition, including "Completions," "Ontario Sunsets," "Wind Over Sand," "Wind Over Water," and "March Vineyard." These themes or groups of work are very familiar types of images in photography. This photographer, however, manages to work with well-known waterside and dune-related beachscapes and to come up with original and powerful pictorial conclusions, in spite of the familiarity of the genre. For instance, #2 in the series "Wind Over Sand" is a picture of a dune-retaining fence made of wooden slats typical of those found at all New England beaches. In the photograph, stripes do many things: undulating as light, descriptively modeling the sand ripples, then rising through light and shadow as fence slats, and running away as so many parallel tracks. 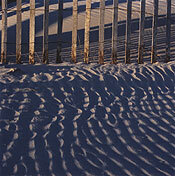 The extended shadows of said fence arc grandly over the background as stripes between receding dunes. Stripes glow as ridged highlights on other dunes in the distance and again finally cross the foreground as fence shadows hinting of more retaining fence off and out of the frame. In the series "Completions," detail in nature, expressive use of focus and inventive compositional sense reach into forest and field in quest of poetry. In the series "Ontario Sunsets," the tonal range is drastically limited and the camera even turned on a 45-degree angle in an effort to enliven a well-worn landscape theme. But the most impressive images were those in the "Wind Over Water" series. That series is split into two areas of study, one of surf and breaking waves and the other of ribbed and rippled ocean surface patterns. 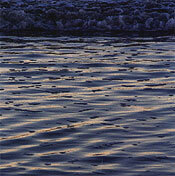 The reaction to particular images in "Wind Over Water" might well be expressed in an abbreviation of the title: W.O.W. (Wow!). 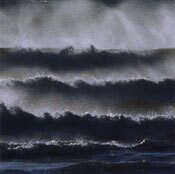 Number one (#1) in the series captures four waves arriving and breaking in succession, as the viewer directly confronts the surf. The use of a telephoto lens has spatially flattened the image so that the waves seem stacked one on top of the other. The dramatically foreshortened view increases the graphic effect of a picture in which contrast is heightened by strong darks within the waves and bright, wind-swept foam. There is a succinctness of vision more common to drawing and printmaking in its graphic simplicity. It almost has the look of a Japanese woodcut from Hiroshige's era. This strong image is more intense because the day on which Cia shot her pictures in Cape May, New Jersey, it was extremely windy and the white surf whipped and blew in exciting and dramatic sprays. The drama is pumped up, by the moody tonal lighting and misty surf, to the point of invoking the ocean as the metaphoric force whose might and mystery have inspired ages of creative imaginations. This stacked surf theme is explored further and quite differently in "Wind Over Water" #6, #7 and #9. Four other pieces from the same series (W.O.W. #2, #3, #4, #5) feature effects of light an movement on the surface of the deep in rhythmic ripples and waves. Reflections and shadows seem woven or as microscopic depictions of natural cell formations on the surface of these captured waters. Where the surf pictures seemed dramatic, these compositions in contrast are quite the opposite; one might even say that they are calmly meditative. If there is a reference to Japanese aesthetic in these nature studies, it would be most particularly crystallized in three final photographs that wind up the show. These detail-oriented compositions entwine the viewer with the intimate relationships between grapevines and the fences which support them. (See photo "March Vineyard" in the exhibit ad on page 12.) Here the bamboo-like knuckles and shafts of the vines' fingers, with their curly, fruitless tendrils, grasp tight the rigidly forged metal-wire fence. Somehow the metaphor of handmade ornamental Japanese craftsmanship can be felt, like pottery handles, ceremonial tools, or other bamboo paraphernalia already familiar to the Western eye, in these carefully selected excerpts from a vineyard's intimate interior. These works in general show a love of the photograph as meditative, contemplatable object, valuable as part of the environment in much the same way that such an object or other would be valued in Japan. An exhibition of Cia Devan's photographic series entitled "Hull Portfolio" opened at the Fitchburg Art Museum in Massachusetts on February 1 and will run through March 21. (See www.FitchburgArtMuseum.org for more information.) The series is part of the Museum's permanent collection. Cia exhibits locally with Spheris Gallery in Bellows Falls and with Young and Constantin Gallery in Wilmington. She is also a member at Windham Art Gallery. The exhibit at the Riverview Cafe remains up through March 2.